Our first full day in Orlando was made up of character meets, exploring the Magic Kingdom, watching Disney's Festival of Fantasy Parade, eating ice creams and buying princess dresses! We slept so well in our super comfy beds - and with the help of some seriously brilliant black out curtains! - and all had a lay in until 8am. 8AM! 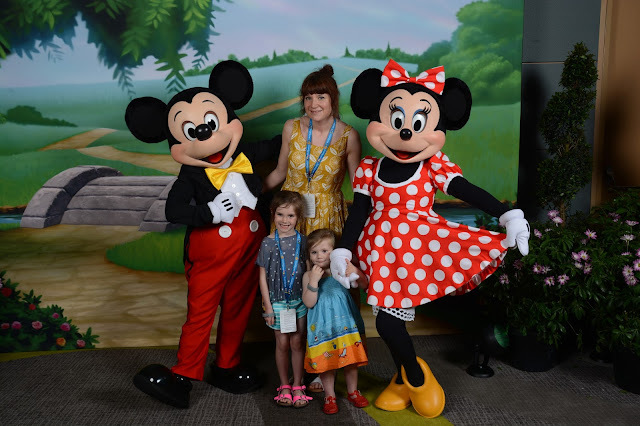 I actually had to wake the girls up in order to get to the lobby in time for our transfer to Disney's Contemporary Resort for a Magical First Hugs breakfast. Travelling between the resorts (on this occasion and others during our holiday) the first thing we noticed was just how completely and utterly immaculate Disney's land was. Despite being a whopping great 43 square miles, Walt Disney World was entirely litter free, with absolutely beautifully kept lawns and gardens. We arrived at Disney's Contemporary Resort for a fairytale character breakfast. While we ate fresh fruit and waffles, and bacon and eggs we were visited by Mickey and Minnie Mouse - and also Anna and Elsa from Frozen! The girls were in absolute HEAVEN. 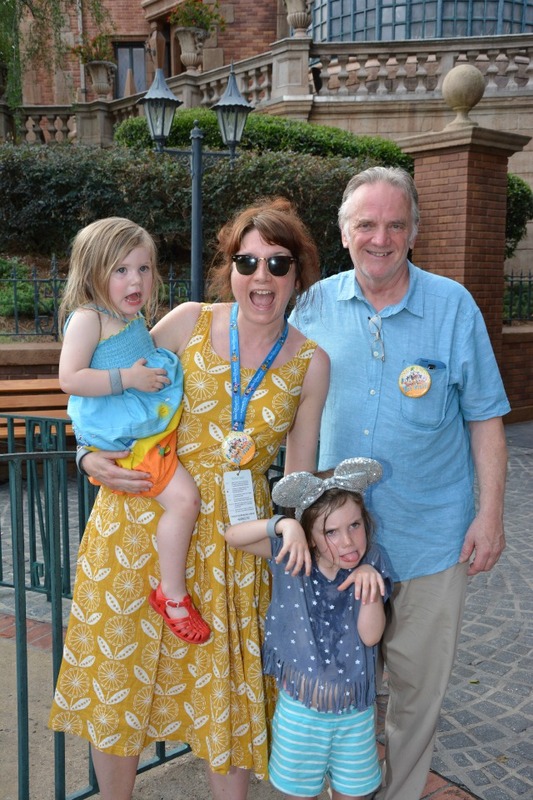 Getting to meet their very favourite princesses - and actually chat to them! - was a dream come true for them both. 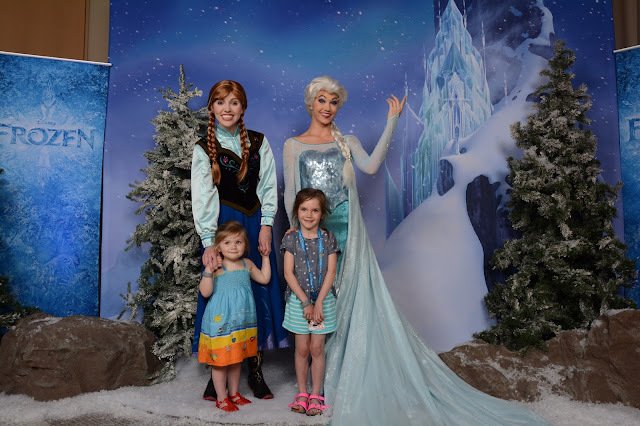 We are SO excited about the new Frozen attraction and royal greeting location that will be opening in Epcot in 2016! After breakfast we caught the monorail to the Magic Kingdom Park, the first theme park to open at Walt Disney World back in 1971. 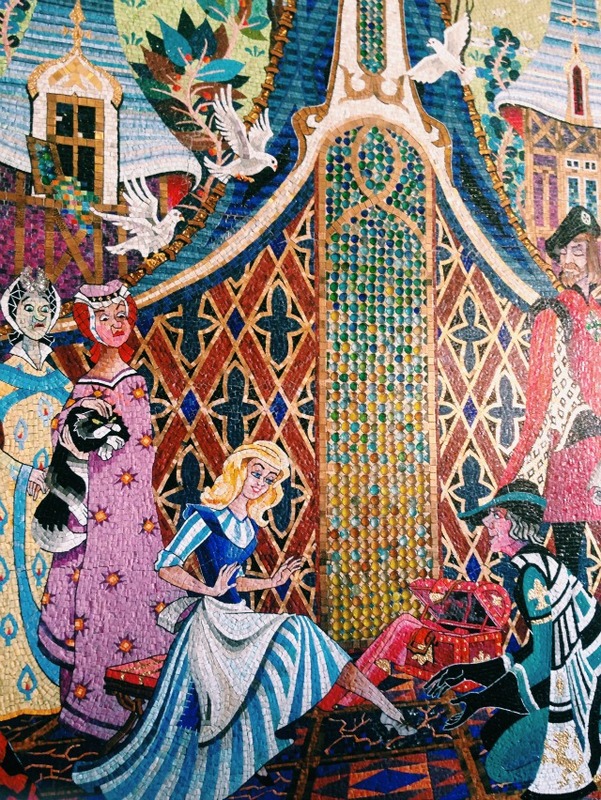 It's divided up into six themed lands — Main Street, U.S.A.; Adventureland; Frontierland; Liberty Square; New Fantasyland; and Tomorrowland with the famous 189 feet tall Cinderella Castle at the centre. 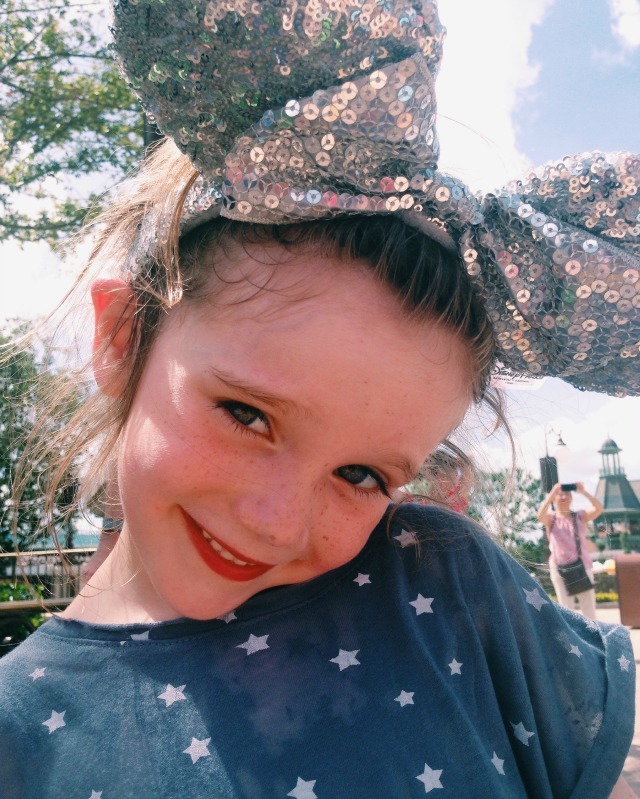 We spent the day going on lots of rides, including Dumbo, Under the Sea, Buzz Lightyear's Space Ranger Spin, the Haunted Mansion, Its A Small World and Peter Pan's Flight. 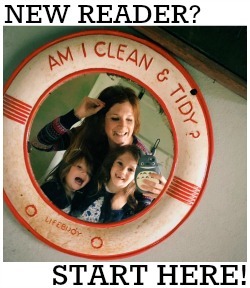 Evie's favourite was Peter Pan's Flight, and Daisy's was the Haunted Mansion which surprised me! 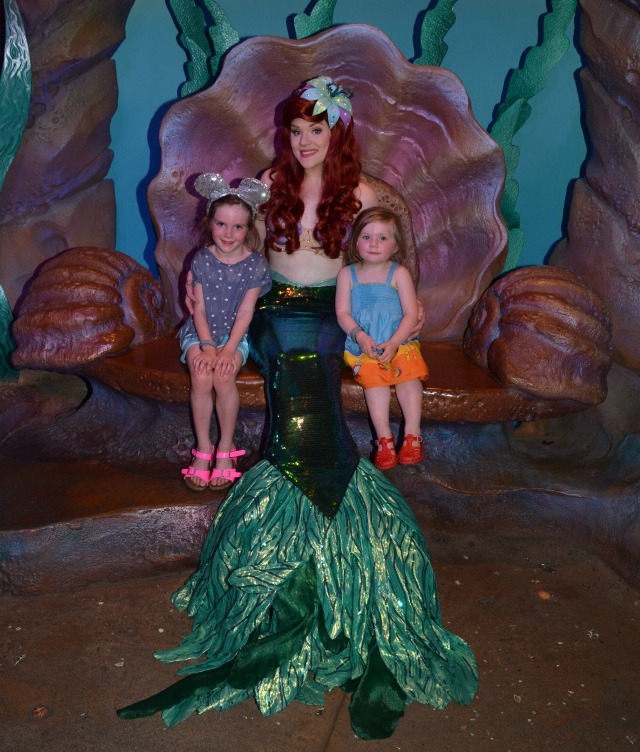 The girls also met Ariel in her grotto. Frozen Fever sundaes with BIRTHDAY CAKE flavoured ice cream! We then had lunch at Tony's Town Square before heading to Main Street for ice cream and to get a good spot for Disney's Festival of Fantasy Parade. No trip to Walt Disney World is complete without watching the parade. 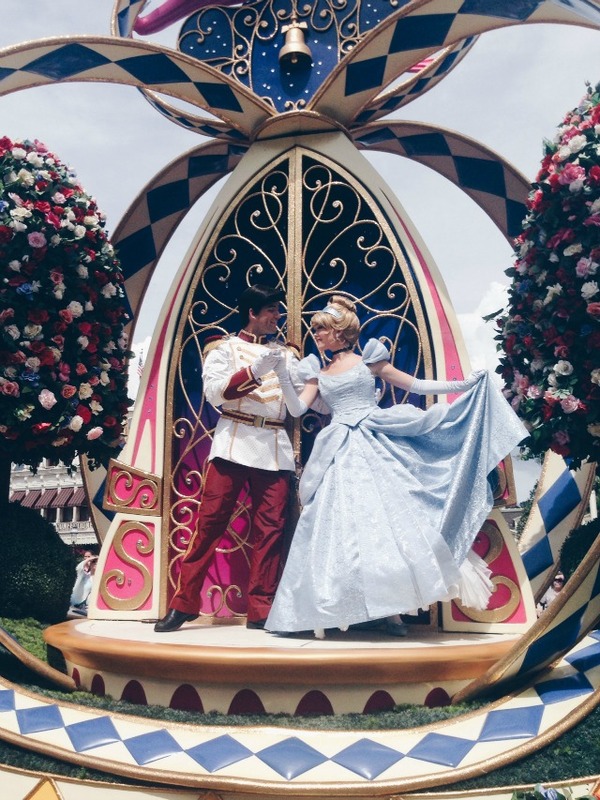 It's so exciting to see all your favourite characters ride past on their gigantic, beautifully decorated floats. The music is loud and hundreds of dancers line the street; magical is the only word to describe it. 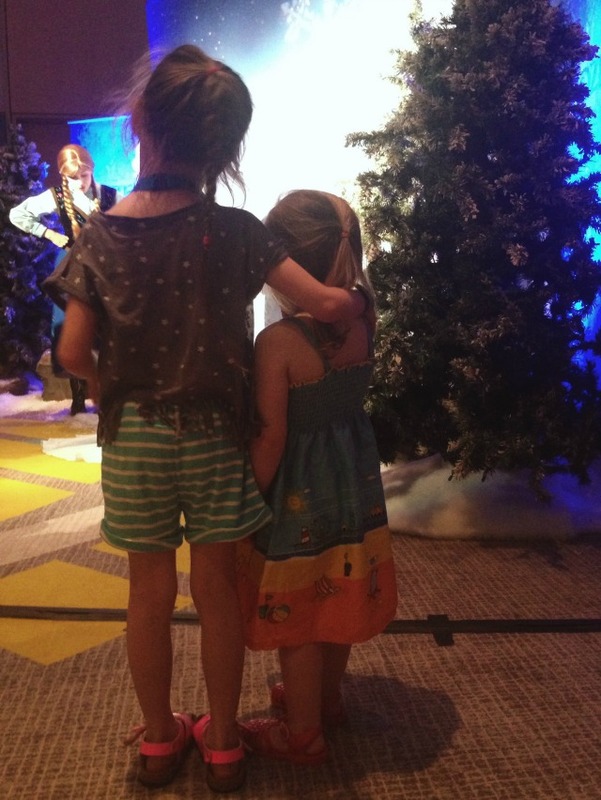 Daisy and Evie were THRILLED to see Anna and Elsa (in actual fact they were the same Anna and Elsa we had met at breakfast that morning and they recognised and waved at the girls which was lovely). After the parade we did some serious shopping, which included buying new princess dresses for the girls. 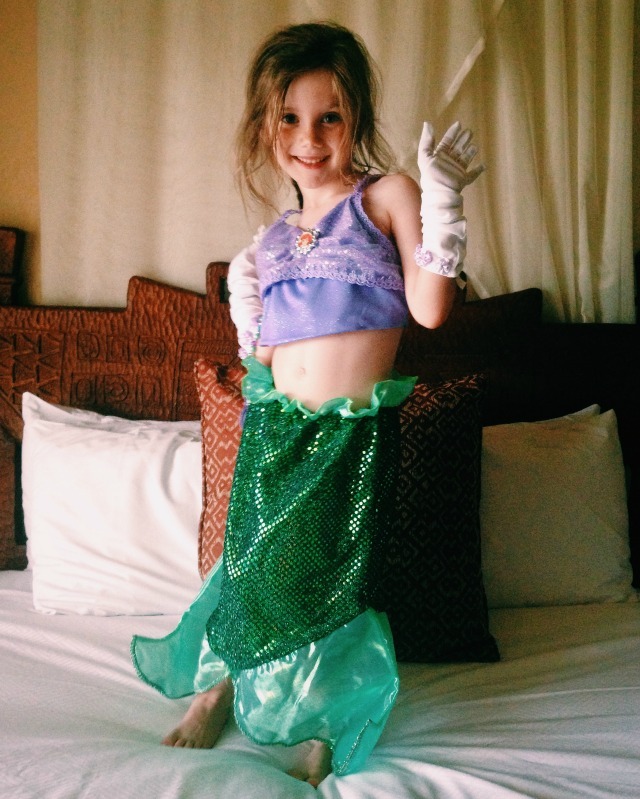 Daisy chose an Ariel outfit (and decided that Ariel is her new favourite princess!) and Evie opted for an Elsa dress. We then paid Rapunzel's tower a visit before heading back to our hotel and sitting out on our balcony in the evening sunshine. 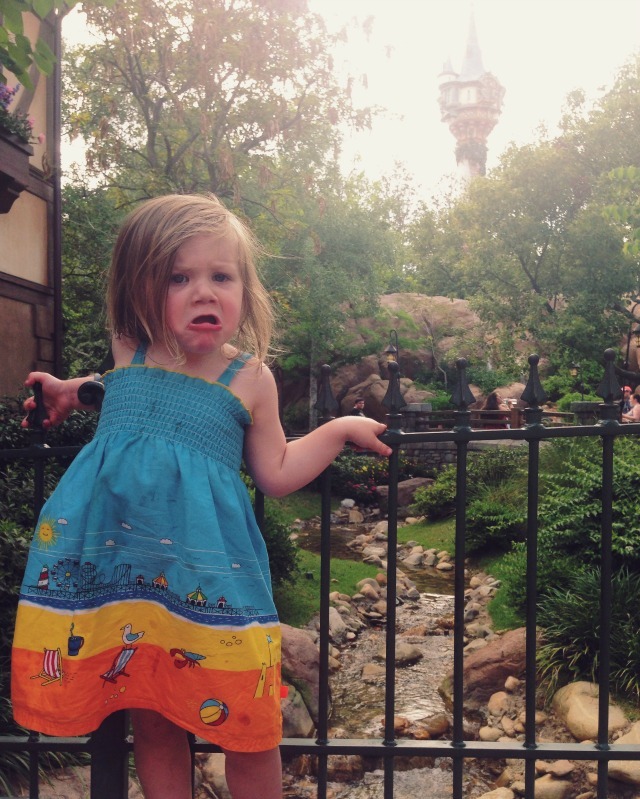 Evie even gave us (and the rest of Disney's Animal Kingdom Lodge) a fine rendition of Let It Go from our balcony in her new frock! That evening we ate at Boma, an African themed buffet style restaurant within our hotel, and then we hoped to get an early night. However Evie had other ideas, having fallen asleep at 6pm and missing dinner, and then waking up at 11.30 with a rumbly tummy! 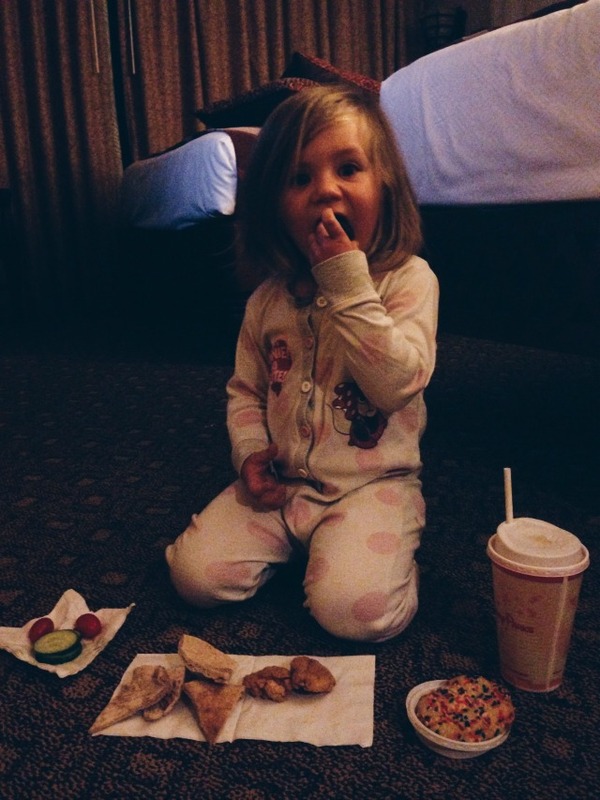 Thankfully we'd brought her a takeaway back to our hotel room so she got to enjoy a midnight feast of chicken, flatbread, salad and a rainbow sprinkle cookie before going back to sleep! Loving the midnight feast. 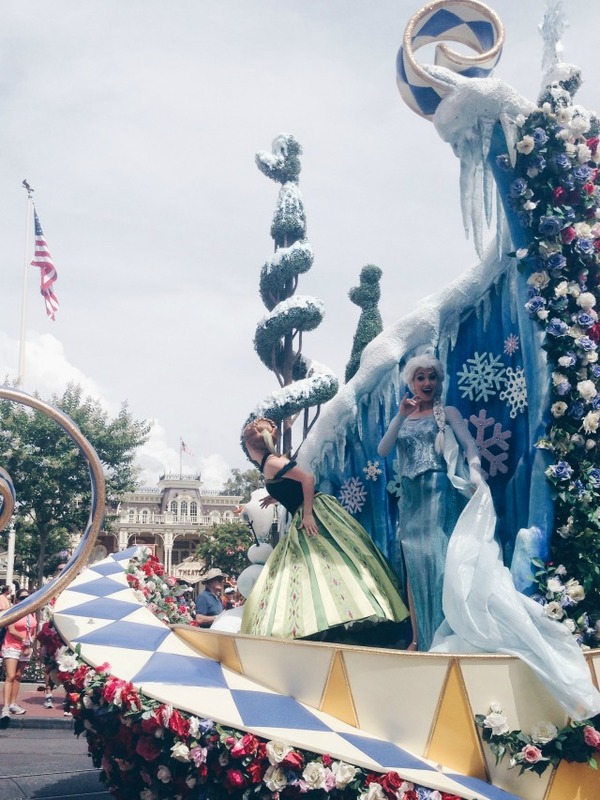 I love Magic Kingdom it's my favourite park, and how lovely to see the same Anna and Elsa. 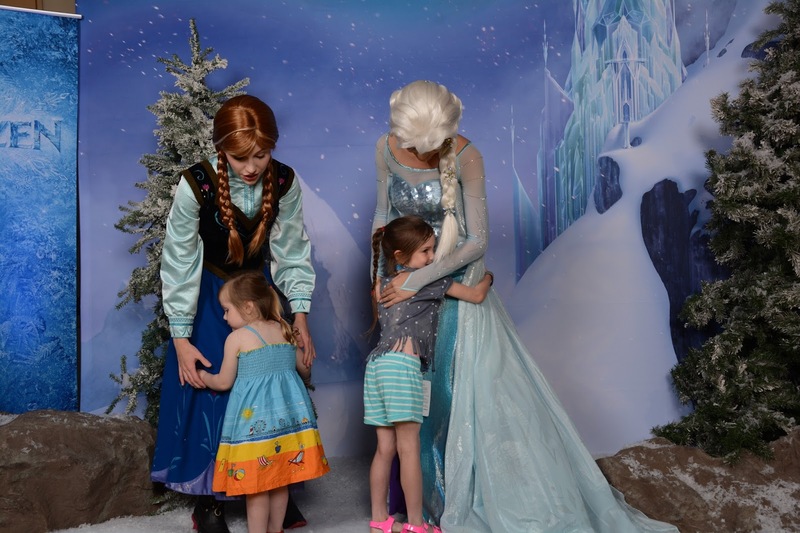 Meeting the princesses is top of my list for our next holiday to Disney.